In the supplemental interview included on the new concert Blu-ray Live on the Queen Mary, the actor best known for playing the title role on the TV series House seems humbled and slightly bewildered by his opportunity to indulge his musical passions. 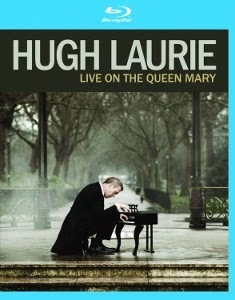 Hugh Laurie isn’t much of a blues singer, but he’s a good piano player and a likeable showman. He clearly knows his music history and has the utmost respect for the New Orleans blues he enjoys playing. With a great band backing him up, this program is fun for Laurie fans. As a bandleader, Laurie proves quite generous, seemingly aware of his own limitations as a frontman. His fiery backing vocalists, Jean McClain and Gaby Moreno, are invited to share the spotlight on several occasions. To say they each blow their leader off the stage is an understatement, but again one senses that Laurie knows (and is tickled by) this fact. He’s eager to show off his musicians as much as possible, including trombonist Elizabeth Lea and multi-horn player Vincent Henry, relishing the fact that he’s playing hooky from his day job. As made clear by the title, the concert was taped live in a club aboard the historic ocean liner RMS Queen Mary. It’s a great venue, probably better than Laurie deserves. Were it not for his fame as an actor, he probably wouldn’t be there. As he runs through old blues numbers, including “Junco Partner,” “The Weed Smoker’s Dream,” and “Winin’ Boy Blues,” Laurie lays on the bluesman affectations quite thick. He’s no Dr. John. Assuming you’re already interested in him, sit back and enjoy this side trip. Eagle Rock Entertainment has provided a pleasing DTS-HD MA 5. 1 surround mix that conveys the band’s nuances very well. Also available on standard DVD. Visit Eagle Rock Entertainment for more information on this and other titles.